Our third day on the Star Pride was at sea and was simply one of relaxing and enjoying the friendly Windstar service. (I did skip the knot tying event on the bridge, however. By the way Windstar has an “open bridge” policy so when not in port you can visit the bridge.) Overall the small ship experience was truly enjoyable…and, jumping forward to the end of the cruise docking in Istanbul next to the Queen Elizabeth really brought home the difference between 212 guests and 3,000 passengers! A noticeable glitch was the obvious lack of staff in the Veranda during the day. Staffing it as a self-service venue when it clearly is not just doesn’t work. When we dined in Amphora in the evening, the less than optimal staffing also caused some lapses in service. Assistant maître de’s should not be clearing tables or waiters running orders to the galley. 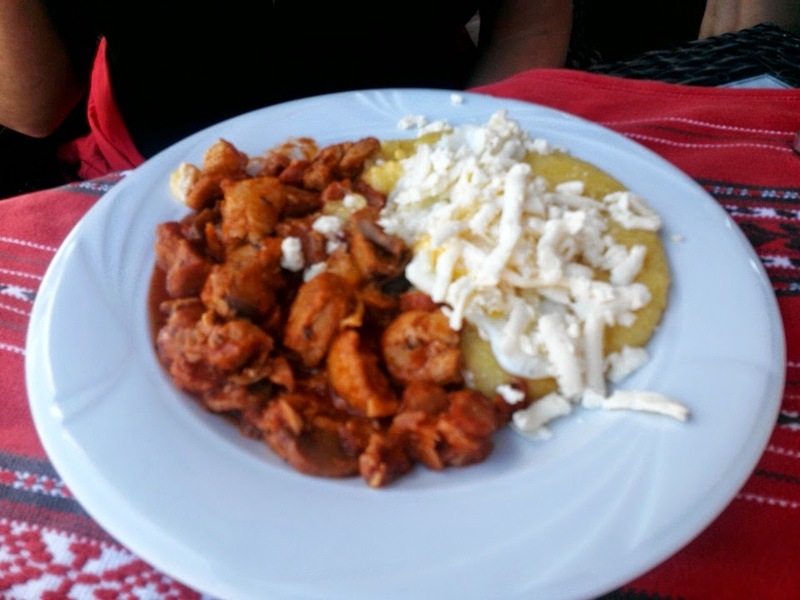 It is a bit frustrating when the food is good, the views are spectacular and trying to order a glass of wine or a burger becomes a frustration…though when the food is tasty and presented well and the wine is poured…and by very friendly smiles…the effects of the frustration slips away. That evening I decided on mixing up the Surf & Turf by substituting the bison filet for the filet mignon. The lobster was very good and the bison was excellent. I did sample the filet mignon, though, and it was prepared nicely with a flavorful and not too heavy sauce. As I said, the Windstar cuisine is quite good; and most certainly better than most cruise line offerings…just with a more laid back presentation. We did tour the very impressive Opera House (originally it had been cancelled, but Windstar made it happen! ), but, as I said, we did not go past the Holocaust Memorial though our bus went in circles for the entire tour. 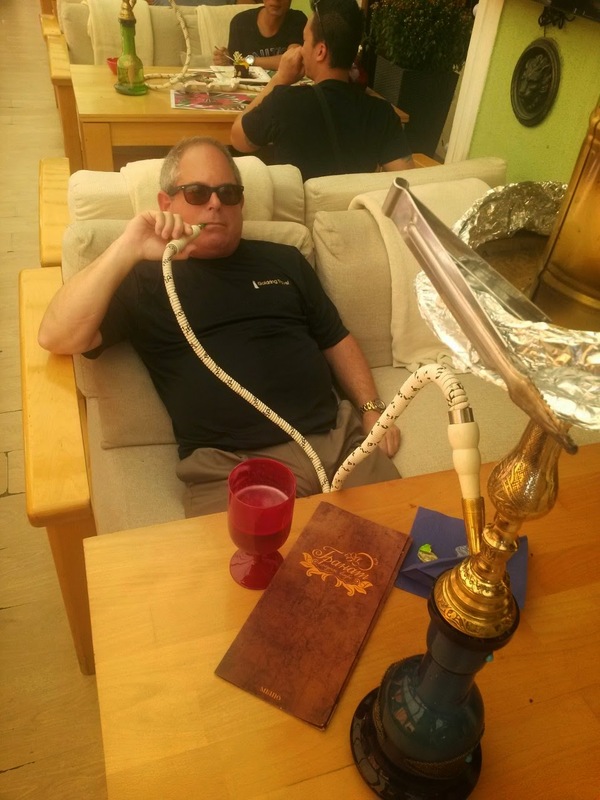 Anyway, after the tour we ventured into town and found a nice place to sit back, people watch, have a drink and smoke a shisha. We were the last people back on the yacht…with two minutes to spare! Back on the Star Pride it was time for a nap and then a wonderful Indian dinner (offered by request the night before) consisting of very delicious prawns, chicken, lamb and lentils along with nan and yogurt sauce. (I understand 36 suites took advantage of this wonderful opportunity.) It was great seeing the staff so excited for the evening and the chef coming out really enjoying himself and all the smiles. If there is one thing you get a great sense of on Windstar is that the staff love their jobs. Topping off my evening was my sitting down on the sofa by the Star Bar and the bartender brining me my Glenfiddich on the rocks without my asking. It is a very nice touch that just isn’t an option on larger ships. The next day was Constanta, Romania which was, and remains, a tough port. The oppressive regime that ended just over a decade ago has left the country still in a solemn and desperate way. The Old City is a monument to neglect despite the clear efforts to revitalize the town. We decided to walk from the port rather than take the complimentary shuttle (it is about a mile) and started strolling down the new seaside promenade. It was rather pleasant until interrupted by a badly decaying casino that looked like it once was “the” place. That sort of patterned continued as we walked here and there. Eventually we decided to have a beer, but the choice of spot came down to which lounge had the view of the least depressing building that had, or was about, to fall down. Afterwards we took the complimentary Windstar shuttle to the beach “resort” town of Mamaia, Romania. That too was “interesting”. As we walked to the beach (which, honestly, was out of season) the piles of cigarette butts, trash and even a pile of rusted screws signaled a beach worse than the Jersey Shore had ever seen in its darkest days. The water was a dismal brown/black from an obvious sewer line that runs from the town into the ocean. The buildings were rundown at best and some had a “bombed out” look worse than anything Asbury Park, New Jersey has endured. 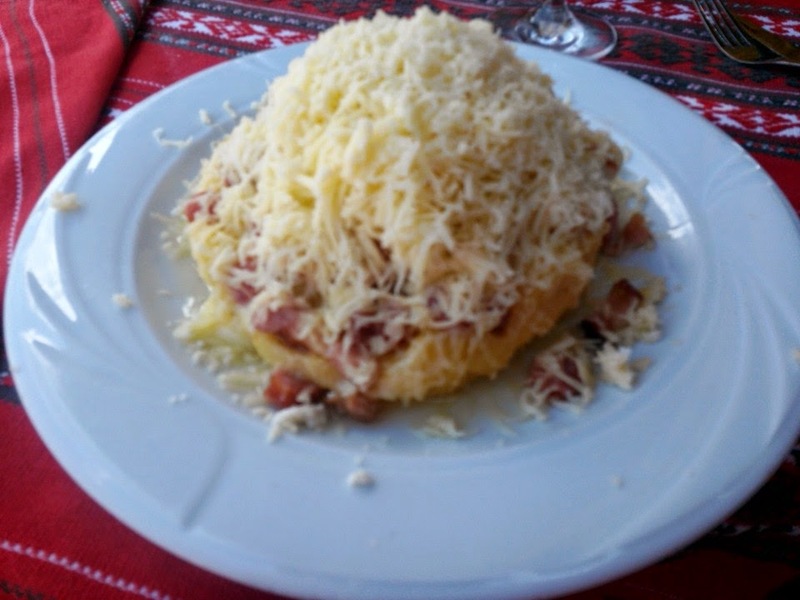 Not dissuaded from finding a gem, we picked the best looking restaurant and ordered a bottle of Romanian wine – Mysterium (which wasn’t bad) - and two supposedly authentic Romanian dishes (Bulz Romanesc and Dobrudjan Tochitura) that were pretty much inedible. 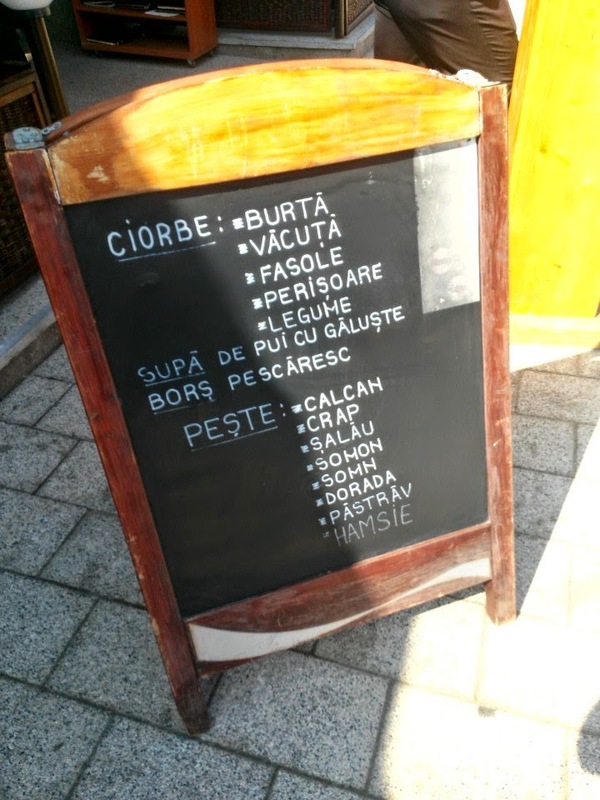 When the menu board says they serve "crap"
I should take the warning seriously! I should note that the shuttles were small buses, run quite frequently, so there was no waiting for the typical cruise ship bus to fill…waiting for “that” person. It was certainly was a more upscale experience. The next day- our last day - was Nessebar, Bulgaria; a charming town and UNESCO Heritage Site. The last time I was in this port I headed out to the Bulgarian countryside so this time the plan was to stay and explore. We docked right in town (last time, on the Radisson Diamond, she was too wide to dock so we tendered) which is one of the big benefits of cruising on the Star Pride. I am glad we got a relatively early start as we had the town pretty much to ourselves walking on the beach (some pretty nice beach glass compared to Romania’s broken bottles! ), strolling down quiet lanes looking at art and souvenirs (and two shops with disturbing Nazi artifacts) and enjoying the architecture. As the morning passed, tour busses started to arrive and the quiet, quaint, village became filled with tourists. It was time to stroll over to the sea side of the village and find a quiet place for lunch. 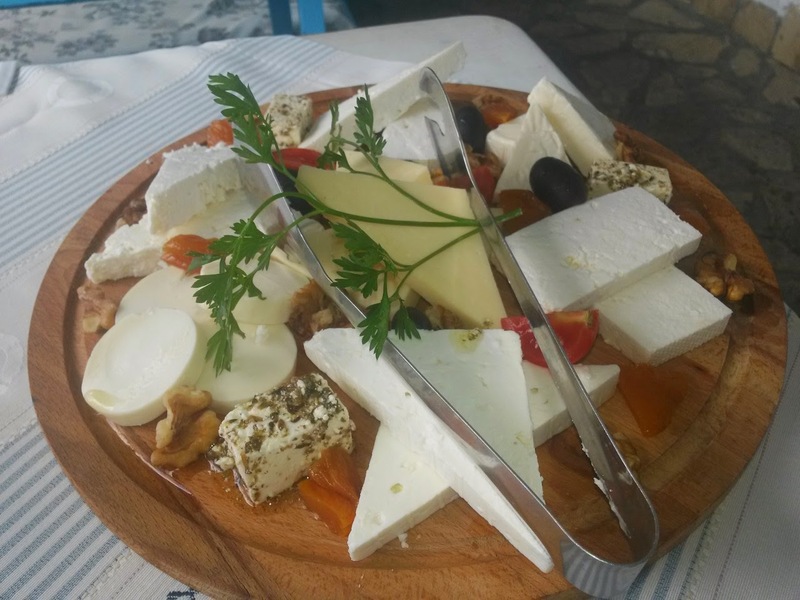 A large wine barrel drew us into Restaurant Andromeda Nesebar which has a wonderful view, friendly staff and decent Bulgarian wine and a nice Bulgarian cheese platter (but I’m not so sure all the cheeses were actually Bulgarian). As we sat and enjoyed it all…being watched by a seagull just waiting for her chance…we thought there was a cat on our feet, but a little scream later it was determined to be a tortoise! We did not expect that! 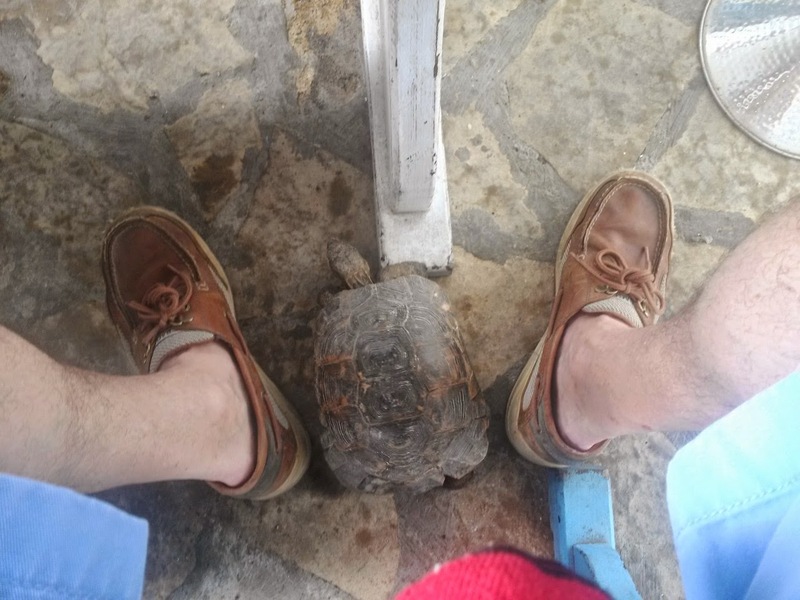 "Hey, there's a tortoise on my foot!" and quickly tossed on the floor for a final nap…as the rain set in…and then, unfortunately, back on the bed to pack. The rain interfered with my last visit to the hot tub, but cleared in time for our final al fresco dinner in Candles and a nightcap at the Star Bar. We arrived early in the morning in Istanbul, but without enough time to do anything before our flight we took it leisurely, disembarked around 9:00 a.m. and headed to the beautiful new Turkish Airlines Lounge at the airport for our flights back home. Next up: A summary of this new Windstar product and the changes and improvements already in the pipeline.